Image provided by A/Prof. David Langton, Monash University, Peninsula Health with permissions. Bronchial thermoplasty is a procedure that applies directed heat to the airway walls, reducing the bulk of airway smooth muscle and thereby reducing the potential for airway constriction. The procedure may also affect airway nerves and inflammatory cells. The device used to administer bronchial thermoplasty was registered in Australia in 2013. 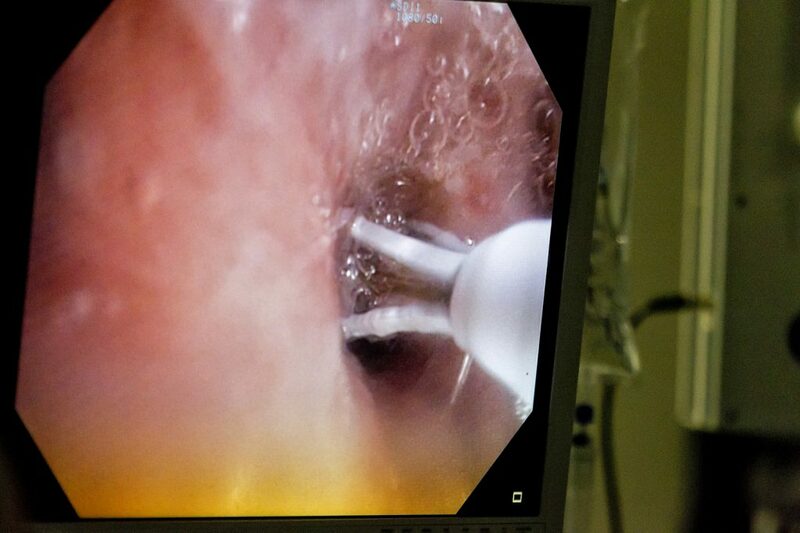 Bronchial thermoplasty consists of three bronchoscopy procedures at least 3 weeks apart. Procedures can be complicated by acute asthma attacks / exacerbations and increased cough and sputum production during the treatment period. The procedures are performed under moderate-to-deep sedation or general anaesthesia. During the procedure, a bronchoscopic instrument is inserted into the airways, which applies radio frequency energy to heat the airway walls, termed “activations”. Multiple activations are applied along the length of the airway, to multiple airways throughout the lung. Patients sometimes experience a short-term worsening of asthma control immediately after thermoplasty. Selection of eligible patients requires collaboration between interventional pulmonologists and severe asthma specialists. Importantly, bronchial thermoplasty causes long-term or permanent changes and cannot be “withdrawn” (as can be considered with add-on pharmaceuticals). Initiation of bronchial thermoplasty requires careful assessment of patient management and consideration of alternative add-on therapy options. It remains unclear which specific asthma phenotypes are likely to benefit most from treatment. No clinical trials have directly compared the effectiveness of bronchial thermoplasty to monoclonal antibody treatment. Bronchial thermoplasty does not improve overall lung function, and a sham-controlled study showed a large placebo effect. Most studies of this procedure have been conducted in patients with moderate asthma rather than severe asthma. Some long-term safety data has been collected for this procedure, and at present no unexpected long-term side-effects have been observed. The ATS / ERS guidelines recommend that all treatments occur in the context of an Institutional Review Board-approved systematic registry or clinical study (Chung et al. 2014). This recommendation is based on the current lack of understanding of which patients may benefit from bronchial thermoplasty, and which do not, and because of limited long-term safety data. GINA guidelines consider bronchial thermoplasty as an option for selected adults with severe asthma whose asthma remains uncontrolled despite optimised therapy following review by an asthma specialist, based on limited evidence (GINA). A presentation on bronchial thermoplasty is available on the Centre of Excellence in Severe Asthma website here.